This album spread includes a series of candid photographs taken during a wedding reception at Roma's Hospitality Centre. 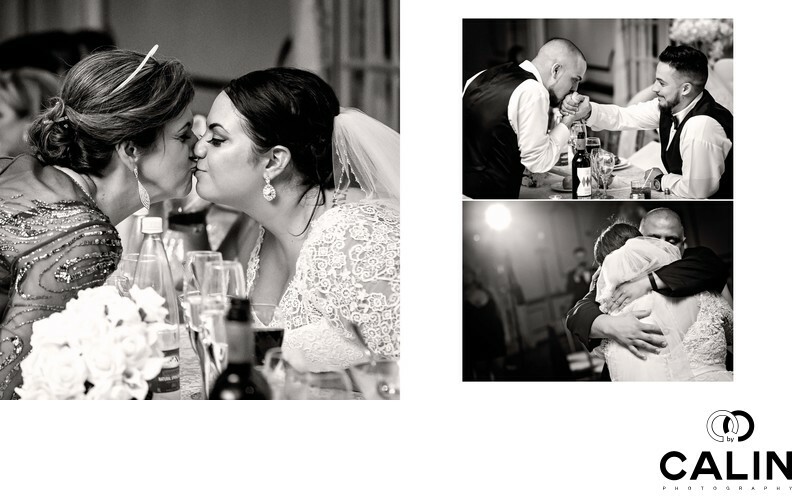 The image on the left features the mother of the bride kissing her daughter on her wedding day. For this image I use the medium telephoto lens to capture this candid moment. More specifically, my lens of choice was my beloved Canon 85 mm F1.2. During wedding receptions, I love to hide and wait for moments like this to unfold. Also, since I switched from zoom lenses to primes, I'm more able to capture images like these. Prime lenses are inconspicuous and less intimidating than for example a Canon 70-200 lens. The second image on this album spread captures the very moment when the groom's nephew kisses the groom's hand. Looks like a scene from the Godfather and the groom is smiling at his nephew. The last image of this album spread features the father of the bride holding his daughter in his arms during the first dance. While we cannot see the brides face, her father's expression is priceless. There are two elements in this image that makes it stand out. First, I included a flash on the left side of the frame so that its flair balances the main subject in this image, the bride and her father. Second, I employed a Dutch tilts technique to align the subjects and the light along the sinister diagonal in the frame. To preserve the candid nature of the photographs in this album spread I chose a black and white processing technique.